Plastics make up a large percentage of municipal solid waste that inhabit landfills. A UTA civil engineer is finding a better use for that plastic just lying around in landfills. Sahadat Hossain, a civil engineering professor at The University of Texas at Arlington, is taking landfill plastic and recycling it into giant pins that are inserted in failing soil on highway slopes. Those pins strengthen the failing soil and in turn the highways, putting off or eliminating the need to repair the roads. 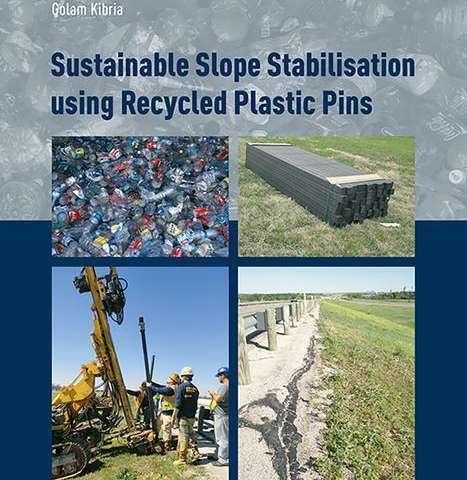 Hossain's research, funded in prior years by the Texas Department of Transportation, has helped lead toward his publishing a book titled: "Sustainable Slope Stabilisation using Recycled Plastic Pins," which will release on CRC Press and Amazon on June 6. Sadik Khan and Golam Kibria, two of Hossain's research team members, who received their doctorates in civil engineering, were co-authors on the book. Khan is working as an assistant professor at Jackson State University in Mississippi. Kibria is working for a San Antonio-based consulting company. Hossain said repair and maintenance due to highway slope failures cost millions of dollars each year in the United States. He said highway slope failures usually happen at a depth of less than 10 feet. Hossain credits the clay content of many North Texas soils for contributing to the highway slope dilemma. Cracks eventually appear in these slopes and create paths for rainwater to seep into those slopes. That water increases pressure on the slope, decreases soil strength and eventually could lead to highway failure. "Plastic, being non-degradable, is problematic if discarded into landfills as they occupy large volumes of landfill space and remain in the landfill for a long period. However, due to the same non-degradable nature, plastic can be very useful and beneficial for civil engineering infrastructure projects," Hossain said. The use of recycled plastic pins made out of recycled plastic bottles, for highway slope stabilization and civil engineering infrastructure projects, demonstrates a perfect example of sustainable engineering solutions. "We also want to add the recycled plastic pins to soil bases and retaining walls to increase the bearing capacity of foundation soils," Hossain said. "We can achieve the same positive impact with the pins in these new areas." The research has led to soil stabilization on some Dallas County highways. "The slope reinforced with recycled plastic pins along U.S. 287 has been performing quite well compared to the control section and a slope that failed across the roadway," said Nicasio Lozano, who leads the Geotechnical Division of TxDOT Dallas District's Bridge Section. "The repair cost of the failed slope runs over a million dollars. The book illustrates a method to stabilize certain slope failures economically and in an environmentally friendly way." The research and book further UTA's Strategic Plan Bold Solutions | Global Impact, especially in the theme of fostering livable sustainable communities theme, a key tenet of that strategic plan.